Every hot rod is a unique creation of the builder. Many hot rods draw heavily on the roots of hot rodding, using what was available in junk yards back in the forties. Hot Rod Steel wheels were standard issue hot rodding gear, often replacing the wire spoke wheels that came on many of the available chassis that were used. 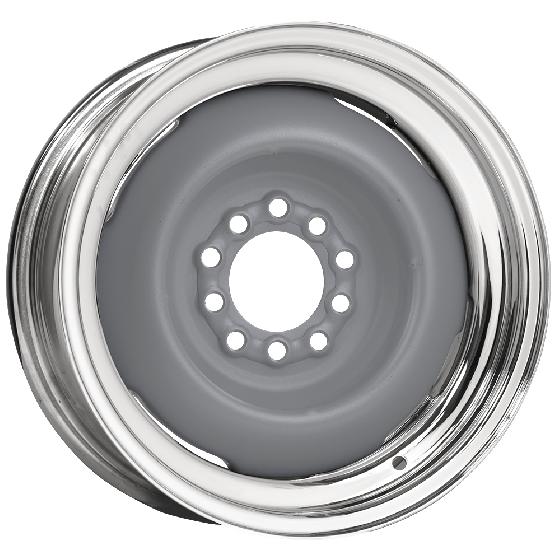 Coker Tire Company offers this huge line of steel hot rod wheels for sale online with a bright chrome outer rim and a ready-to-paint primed center. These wheels offer tons of flexibility for builders, both in sizes and in which caps you decide to use, sold separately. With sizes ranging from 15x5 to 20x4 1/2 and over 10 different powder coating options available for the center, the hot rod steel wheel can be tailored to your project. These wheels are offered in a variety of popular single and multi bolt patterns.